EAST MILLINOCKET – Residents of East Millinocket are being asked to join the rest of the Katahdin region in a survey meant to assess existing transportation options and difficulties in accessing basic transportation in the region. Thrive Penobscot, a local coalition helping residents find resources for basic needs and working on strategies so people can stay in their homes longer, is working with the University of Maine Center on Aging on a survey to help define the needs. The goal, said Jane Danforth director of Thrive is to come up with ways to break down those barriers and find solutions. Recognizing that people’s time is valuable, Danforth said she will be giving out $25 Hannaford gift cards to those willing to be interviewed. The cards are also honored at Ellis Family Market. Ultimately Danforth said the information gathered will be used to create a plan of action that may include funding a local group of volunteers to fill the transportation gap. Another example -if concerns with the Penquis operated Lynx are identified then Danforth said they will work with Penquis to allay those concerns and find ways that work. The data gathered will be used in future grant applications and each town will have it for their comprehensive plans. Danforth said Thrive and UMaine will interview approximately 50 transportation dependent people across the Katahdin region beginning in April to get their stories on what works and what doesn’t. There will also be paper surveys available for every resident in the region – they are also working on an online option too – and people will be asked their opinions on what is needed. Other than be informed and supportive of the efforts, selectmen asked how more they could help. Danforth said that when the paper surveys are ready to be out for the general public she will need a well traveled space to put them and selectmen recommended the town office. They also suggested the East Mill Federal Credit Union might be willing to help. Danforth said residents can take the surveys home and return at their convenience. She said she’s trying to make it as easy as possible because it’s pretty common to have a low return rate on surveys. As an added incentive those participating will be entered into a drawing for a Hannaford gift card. Selectman Kyle Leathers said he’s heard stories of people who have a vehicle but when it breaks down and they don’t have the money to fix it immediately they become transportation dependent for their jobs, medical and other appointments and that happens to many people. It is a real problem and a vicious circle because if you can’t work you can’t pay your bills and get your car back. Danforth said you have to identify the problems and then work on solutions – these conversations with people are a necessary step. 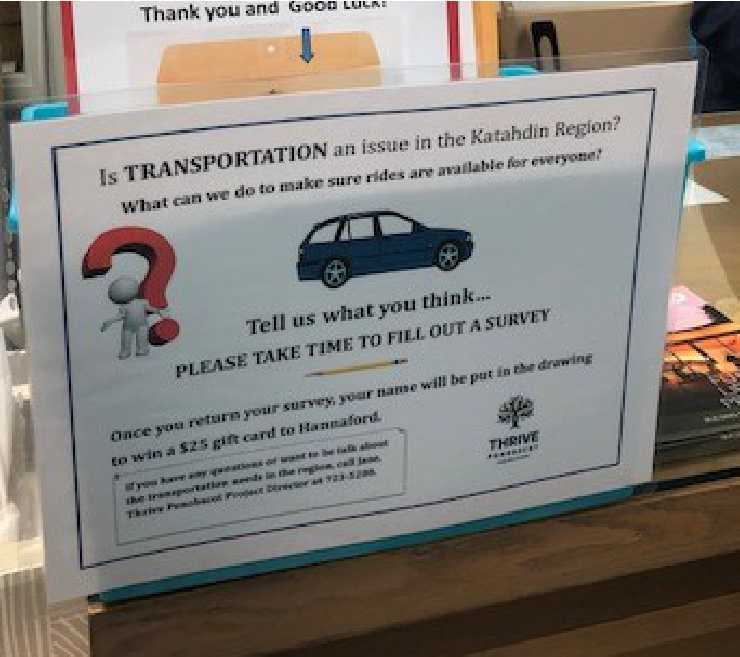 Danforth said there are already small groups of volunteers who do local transportation and the quick win with this survey and subsequent grant funding might be coordinating those efforts into a centralized location that can be used by more people. Selectmen thanked her for her work and she said she’d bring surveys down soon.